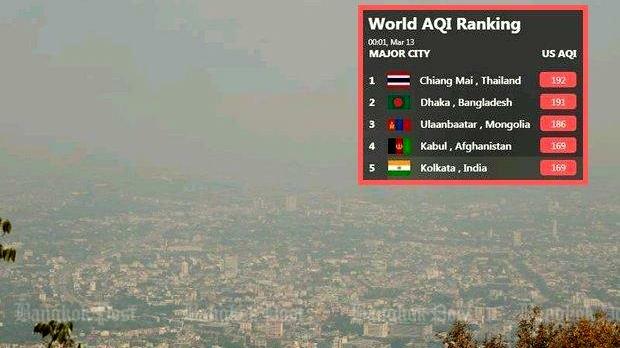 The air quality index (AQI) in Chiang Mai as of 4am Tuesday stood at 230, compared with 170 in the Bangladesh capital Dhaka and 164 in Kabul, Afghanistan, according to Air Visual, an app that monitors air quality. At midnight Tuesday, in slightly cooler night-time temperatures, Chiang Mai still was listed as the world’s worst, with air quality in the high-danger zone for all residents. The AQI measures a broad spectrum of air pollutants including PM2.5, PM10 and carbon dioxide. Information from the Pollution Control Department (PCD) confirmed the haze in the North had reached worrying levels. PM2.5 refers to atmospheric particulate matter (PM) with a diameter of less than 2.5 micrometres, which is about 3% the diameter of a human hair. It can lodge in the lungs and enter blood vessels, leading to respiratory and cardiovascular disease. According to PCD-supplied information taken from 17 air-quality-monitoring stations in nine provinces as of 9am Tuesday, the level of PM2.5 ranged from 70-124 microgrammes per cubic metre (µg/m³), exceeding the safety standard of 50 µg/m³ or lower. 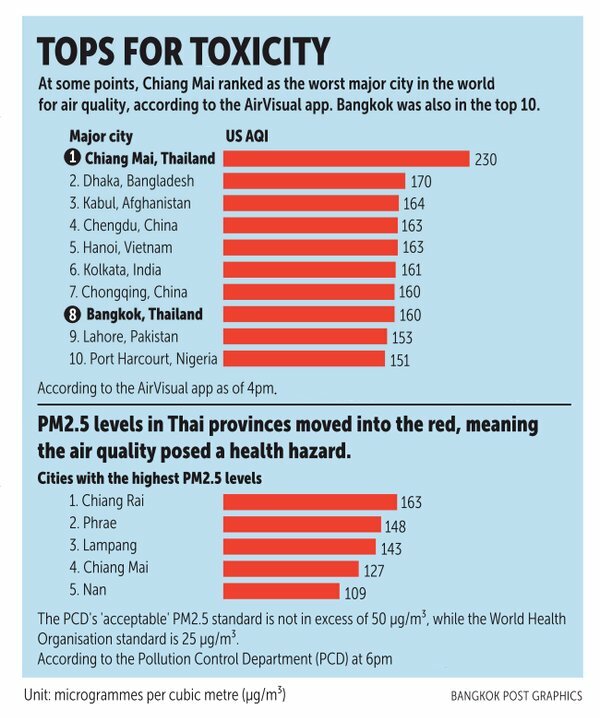 Chiang Rai’s Mae Sai district had the worst recorded level (163 µg/m³), followed by Phrae, Lampang, Nan and Chiang Mai. The pollution has become such a pressing concern that Prime Minister Prayut Chan-o-cha is scheduled to visit Chiang Rai this Saturday, eight days before the national election. “Prime Minister Prayut will take a field trip to Chiang Rai with the purpose of following up on measures to deal with the haze in the North,” Pralong Damrongthai, director-general of the PCD, told the media Tuesday. Dr Rangsrit Kanjanavanit, a Chiang Mai resident who serves as a lecturer and cardiologist at the Faculty of Medicine at Chiang Mai University, said the smoggy skies show how the government’s campaign to eradicate forest fires and open burning has yet to prove a success. Dr Rangsrit, who also holds the post of vice president of the Seub Nakhasathien Foundation, said the government should come up with more sustainable and comprehensive measures, instead of just arresting farmers who start fires or firing water to try to control dust levels. “It should find a way to dissuade farmers from burning [waste] by giving them incentives,” he said. Some of the haze has been attributed to neighbouring countries like Laos and Myanmar. As such, critics say Thailand should work more with other governments to tackle the widespread practice of open burning. Haze has been a seasonal problem in the North for over a decade. It usually appears from January to April but peaks in March as the extremely dry conditions increase the magnitude of forest fires. This is compounded by farmers burning waste to clear land for the next harvest season. This yearly environment disaster is a big complain about ChiangMai government province law enforcers. They simply allow this yearly happening. ChiangMai is already many years not a 'rose of the north' anymore. To call the worse place on earth that is a big joke. And hey, it is not natural fog. It is by thai human made/initiated  hazardous smog.